Krasnaya Polyana is a unique location, perfect for the mountain rest all year round. Winter season lasts 6 months here – from December to May! That is half a year of freeride, backcountry, ski touring and Heli-skiing with professional guides of the Yeti Guide Bureau. What does freeride with guides in Krasnaya Polyana mean? That is the best snow, varied terrain, skiing in the Alpine and forest zones, vertical drop to 1500 m, and guaranteed pleasure regardless of the level of your training. Your safety is our priority. It is insured by the certified guides of Russian Mountain Guides Association. 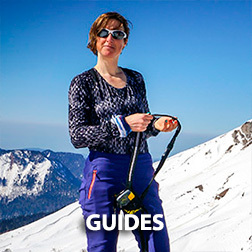 The programs given on the site are the standard product of the Yeti Guide Bureau. You are always welcome to order an individual program of any duration and complexity. For detailed information, please, contact us by phone or email. How to define your skiing/snowboarding level? This description will help you to identify you skiing/snowboarding level and choose an appropriate group. We are especially glad to meet you. Move forward, develop your skills, and we are ready to help you. Our guides will do their best to make your skiing/snowboarding comfortable and full of positive emotions, discoveries and impressions. You feel confident on red and black pistes and have tried off-piste for several times. 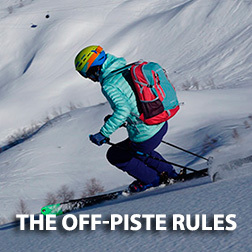 As a rule, it means not touched classical broad smooth slopes with the angle not more than 30 degrees and shallow snow in comfortable condition (powder, spring sliding snow). 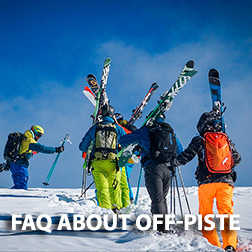 At that, you objectively feel that you need to improve your off-piste technique for more comfortable skiing/snowboarding. You have some difficulties with long descents without stops. You prefer to break a long descent into some intervals to catch your breath. It is highly undesirable for you to descend in narrow couloirs, forest areas, on hard icy slopes, knolls and drifts. Descents on deep or heavy wet and sticky snow, or on ice crust, as well as with bad, flat visibility are rather difficult for you and lead to frequent falls. You try to avoid slopes with an angle of more than 40 degrees. You have considerable off-piste experience. You feel confident in narrow couloirs and on slopes with varying degrees of relief. You control your speed and can adapt your technique to the terrain and snow conditions, whether it is a hard icy slope with the angle of 40 degrees, deep snow, forest, or piste. Skiing/snowboarding on knolls, ice crust, or heavy wet snow, as well as with zero visibility, is a technical problem for you. The snow condition does not matter for you: ice crust, heavy wet snow, or hard and icy zones with drifts. You control your speed and adapt your technique to any terrain, visibility and snow conditions. The angle of the slope over 45 degrees means even more fun for you. Knolls, ice crust, frequent forest are not a problem for you but the elements of interesting and various skiing/snowboarding.